Every repair is treated with respect to the particular item and the applications it will be performing. 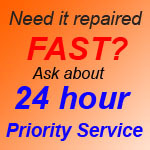 We guarantee to have your item back to you in top working condition. Period. We strive, with each repair, to give you the most efficient working unit at the best price and the fastest repair time possible. We take pride in our service and experience and are proud to offer our 12 Month Warranty on each repaired or refurbished unit. We must admit, returns are rare, but when they do occur, please know they are given top priority! We will make the repair right. Call us! Letting us know there is a problem and what it may be is crucial. Most of the time, the problem is directly related to an installation, programming or configuration issue. These issues can often be handled immediately over the phone. What does this mean to you? No down time… no loss production… no loss revenue. Send us the Repair. After we verbally access the situation and determine that the item is under warranty*, we will need to evaluate the issue. Be assured, your warranty will be looked at immediately upon arrival. Be sure to send in a written explanation of the problems occurring and any documentation about the original repair. We strive to limit the “fine print” however, we must include some of the obvious. Our warranty is void if failure or defect of the unit has resulted from unfavorable conditions from the environment or otherwise, misapplication, operation exceeding the rated capacities, accidents or abuse/ negligence, cannibalization of parts, contamination, improper calibration, storage, or any unauthorized maintenance or repair by customer or otherwise. We respectively reserve the right to return the cost ot the repair, or to replace or repair any warranted item. At no time may REA Technologies, Inc. be held liable for any damages, whether direct or indirect, of any service, repair or product provided. These damages are not limited to expenses, loss or profits from products or business suspension.